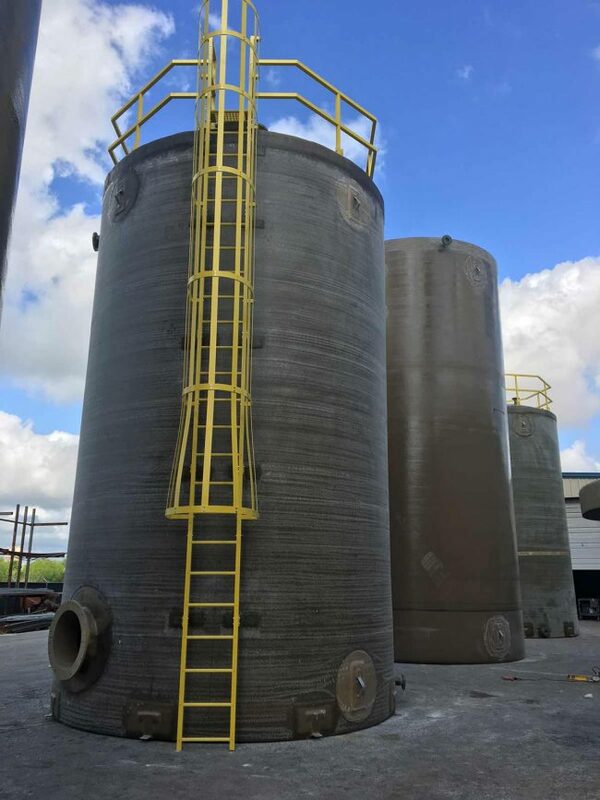 We offer tank diameters in 8’, 10’, 12’, 15’6” diameters and any height up to our largest 50,000-gallon tank. We offer straight or OSHA caged ladders in fiberglass or galvanized steel. Other tank accessories are walkways, platforms, decking, support rails, hand rails, stairways and containment walls that will enhance and compliment your tank farm layout. For corrosive environments we can use stainless steel for all lifting hooks, anchor lugs and nuts and bolts instead of our standard galvanized steel. All specifications are followed to ensure the maximum structural integrity. 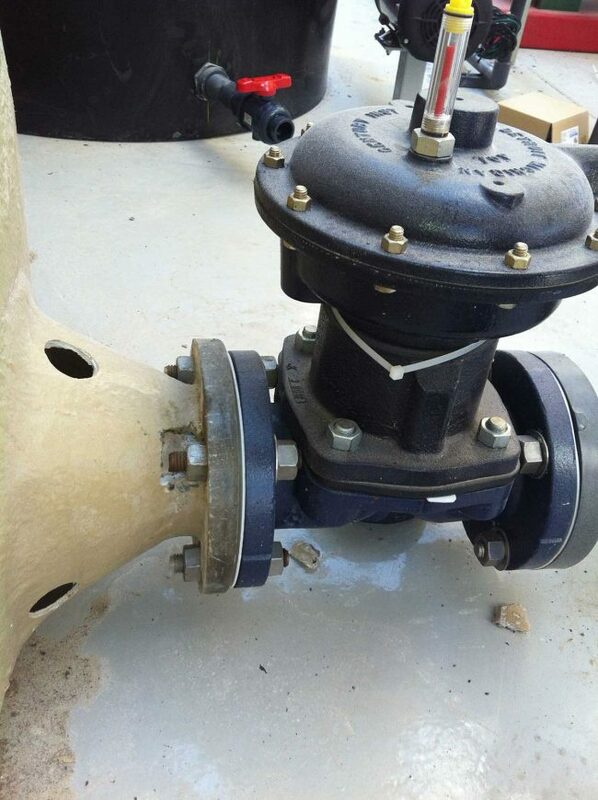 We offer tank diameters in 8’, 10’, 12’, 15’6” diameters and any height up to our largest 50,000-gallon tank. Fiberglass tanks are becoming the first choice to handle containment needs due to their resilient properties. Easily formulated and designed to customize tank for different uses, products and temperatures. All of our above ground tanks are customized to suit the end users needs. Custom components, nozzles, internals and corrosion liners are all designed to meet operating criteria. Depending on the contents of the tank, we will engineer the proper resin liner to match the service. 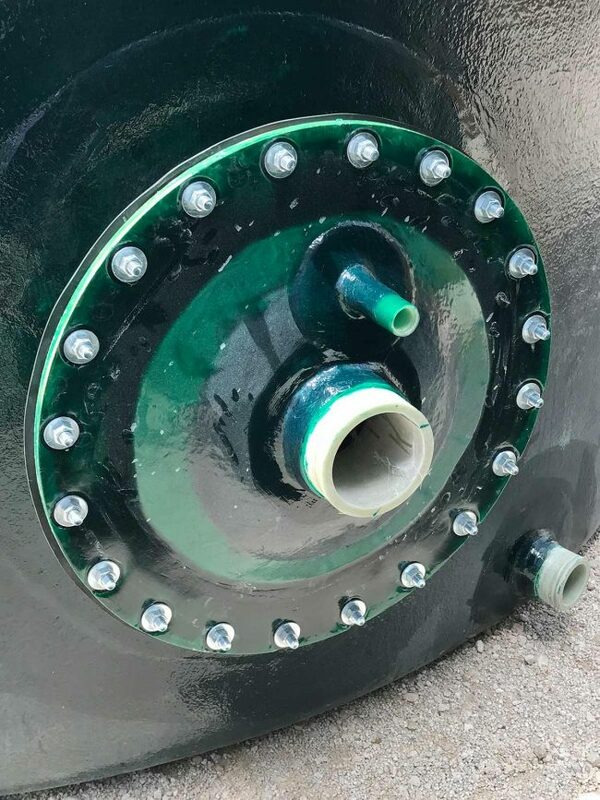 Failures and issues occur when fiberglass tanks are not built to meet service conditions or quality procedures are not followed. Often end users do not know the right questions to ask to ensure they are getting their fiberglass tank properly specified. This is important due to the many different grades of resin and glass. Our resin chemists review all service needs of the tank to ensure an accurate recommendation for type of resin liner and resin structure. 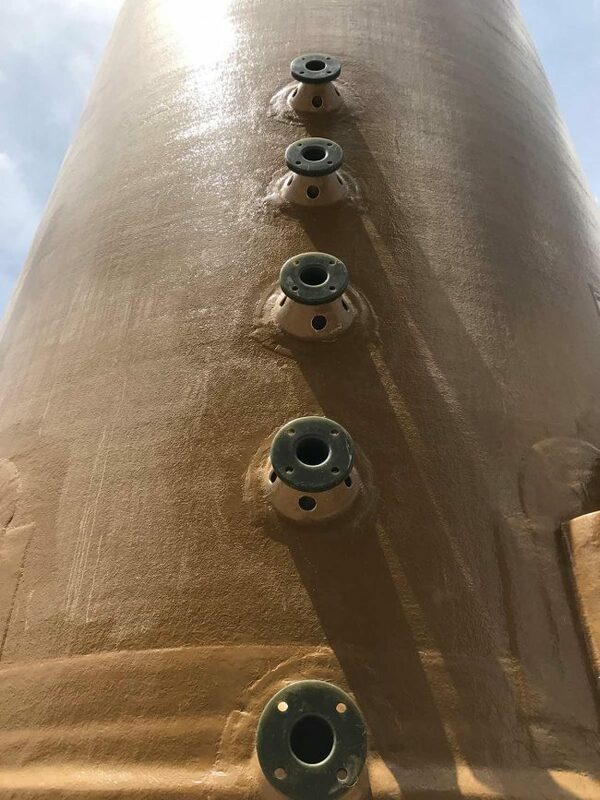 The resin liner or corrosion barrier is a critical layer that must be designed properly to ensure effectiveness, safety and performance of your tank. The liner is typically fabricated with a synthetic veil using a corrosion grade vinyl ester resin rich layer before the glass rich structure begins. The design and thickness of the barrier liner will depend on your specific service environment. 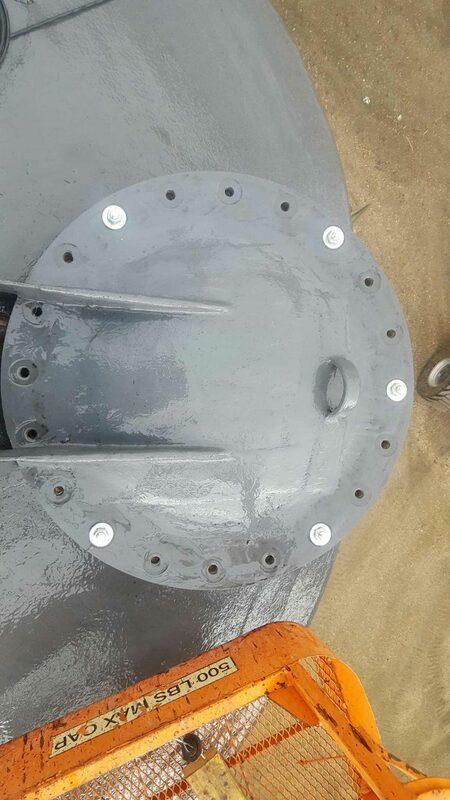 Nationwide Tank and Pipe’s detailed review and design process ensures quality procedures and specifications are followed delivering a long lasting durable tank. All our tanks are lined with Nexus Veil, which ensures the end user, complete separation of the contents of the tank to the structure of the tank. 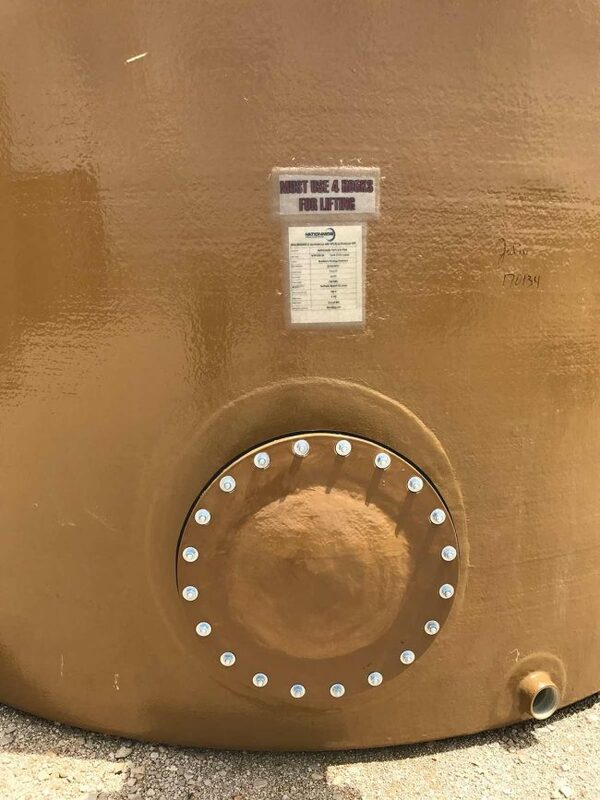 Typically Nexus Veil is only used on chemical tanks, but we choose to install on all our tanks providing exceptional quality and value to all our customers. Just another example of how we go the extra mile for the customer providing a storage solution with a long and trouble free service life. Depending on the contents of the tank, we will engineer the proper resin liner to match the service. Failures and issues occur when fiberglass tanks are not built to meet service conditions or quality procedures are not followed. Often end users do not know the right questions to ask to ensure they are getting their fiberglass tank properly specified. This is important due to the many different grades of resin and glass. Our resin chemists review all service needs of the tank to ensure an accurate recommendation for type of resin liner and resin structure. 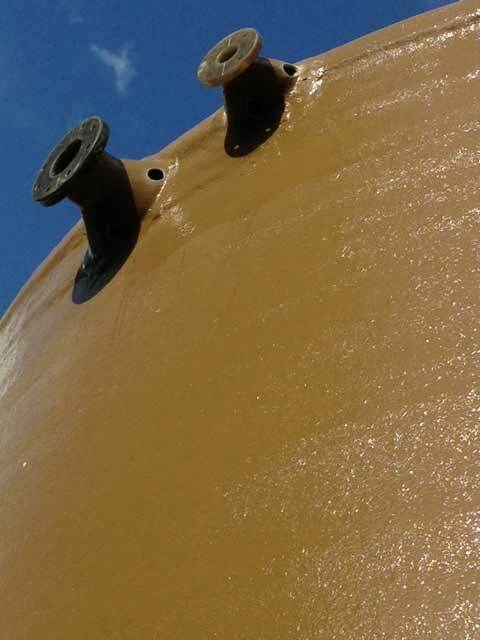 The resin liner or corrosion barrier is a critical layer that must be designed properly to ensure effectiveness, safety and performance of your tank. The liner is typically fabricated with a synthetic veil using a corrosion grade vinyl ester resin rich layer before the glass rich structure begins. The design and thickness of the barrier liner will depend on your specific service environment. Nationwide Tank and Pipe’s detailed review and design process ensures quality procedures and specifications are followed delivering a long lasting durable tank. All our tanks are lined with Nexus Veil, which ensures the end user, complete separation of the contents of the tank to the structure of the tank. Typically Nexus Veil is only used on chemical tanks, but we choose to install on all our tanks providing exceptional quality and value to all our customers. Just another example of how we go the extra mile for the customer providing a storage solution with a long and trouble free service life.